Al Batt of Hartland is a member of the Albert Lea Audubon Society. Email him at SnoEowl@aol.com. My neighbor Crandall stops by. “How are you doing?” I ask. Looking out the window is always worth the effort. It framed a white landscape. Snow hasn’t been elusive this winter. February was particularly generous with its snow. The DNR says January is our snowiest month on average, followed by December, March, November, February and April. I shoveled snow as I listened to a male cardinal sing his spring song. “What-cheer, cheer, cheer, birdy, birdy, birdy, birdy.” A black-capped chickadee whistled, “Spring’s here,” “Sweet-ie,” “Love you,” or “Fee-bee.” A white-breasted nuthatch celebrated the increasing day length by giving voice to “Wha-wha-wha.” Drumming woodpeckers provided a percussive accompaniment. I heard a house sparrow cheep. I’ve heard them called cheap birds. In India, the Nature Forever Society has tried to rally conservation interest by declaring March 20 World Sparrow Day and naming it the state bird of Delhi. The Society’s president said, “The house sparrow is one bird which is seen by everyone, by kids, by adults, by people from various socioeconomic strata. It is a bird of the common man.” The house sparrow is the default little brown bird we see in parking lots and yards, on street corners and sidewalks, and on farms. Raccoons raided my feeders. The deep snow has given the rascals the height needed to get to the feeders. One of them stole a suet feeder that I cannot locate. Winter had been a beast, but a friend told me of a silver lining. He said the weather brought more cardinals than ever before to his feeders. Snow melts first at the base of trees because the dark color of trunks absorbs energy from the sun. This heat energy is absorbed by the snow around the base causing it to melt. I strolled around the campus of Bethany Lutheran College in Mankato in early March and found myself mesmerized by robins and red-winged blackbirds. The birds were the ones flying, but they lifted me. The vernal equinox was on March 20. When spring comes, can winter be far behind? We need a change of scenery, but we get an in-between season called sprinter. “How often do snakes shed their skins?” Snakes shed their skin to allow for further growth and to remove parasites attached to their old skin. The average snake sheds its skin two to four times per year. This varies with age and species. Young snakes that are actively growing may shed their skin every two weeks. Older snakes might shed their skin twice each year. “How can I tell a male robin from a female?” It can be difficult to tell male and female American robins apart, but the males are slightly darker in color. Young robins have dark spots on their breasts. Robins are considered harbingers of spring, but many robins spend winter in their breeding range. 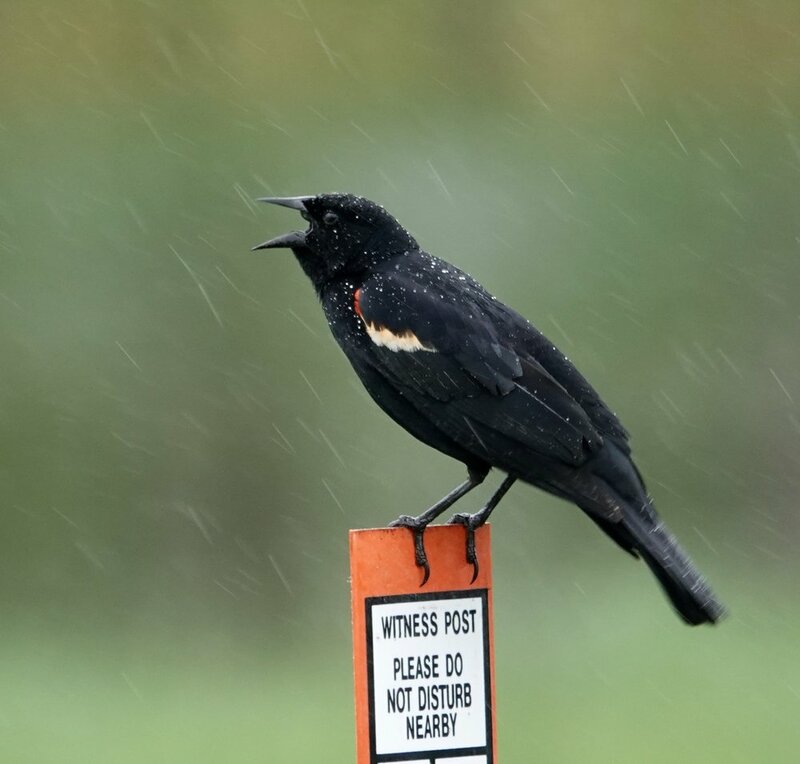 “Why don’t I see robins at my feeders?” Robins are infrequent visitors to bird tables because they have never taken the training required to become certified as a feeder bird. Feeders don’t typically offer a fare favored by robins. “I replaced an old bird feeder with a new one, but the birds don’t seem to like it. What can I do?” If you put it in the same place and are feeding the same thing, it is odd. You could put the old feeder back up and let it go empty while keeping food in the new feeder nearby. “How long does a mourning dove live?” The oldest known mourning dove was a male at least 30 years, 4 months old when he was shot in Florida in 1998. He’d been banded in Georgia in 1968. The mourning dove is the continent’s most popular game bird. “At what temperature does an outdoor insect become active?” It varies according to the insect, but most become active when their body temperatures hit 50 to 60 degrees. This is the ambient temperature influenced by sunlight. A black-capped chickadee does a few chin-ups. The Hay Bale Family seems happy. 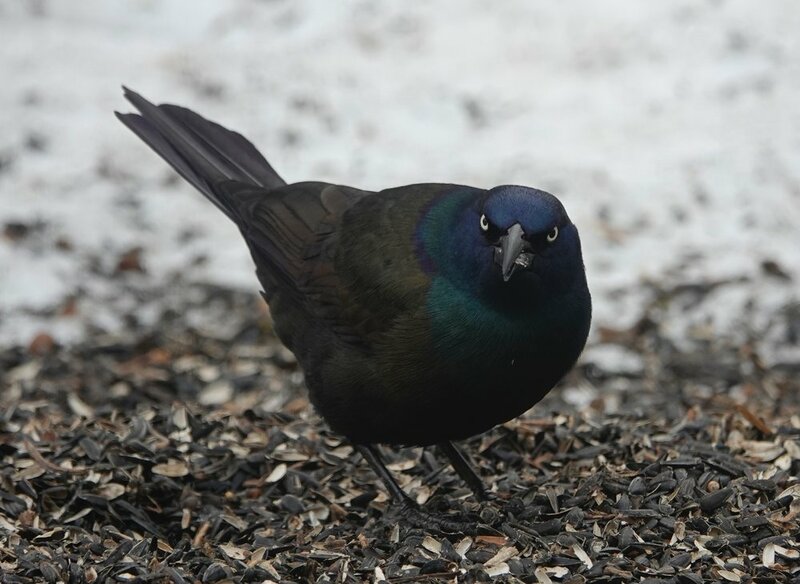 The common grackle found something to eat, but it didn’t look happy. 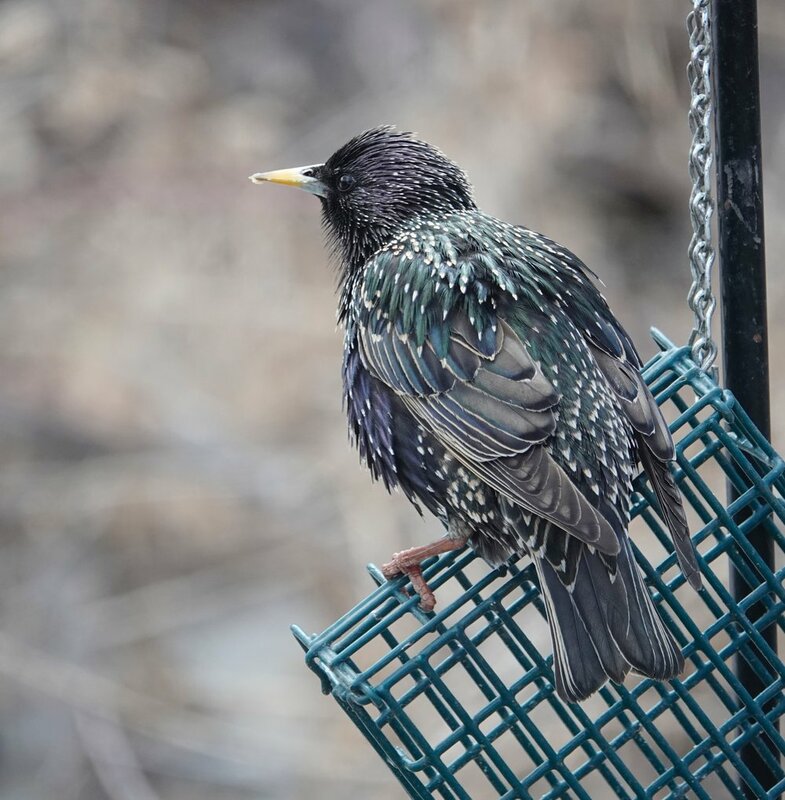 This starling waited patiently for me to replenish the suet. This common grackle looks as if it had coffee with its breakfast seeds. A common grackle proclaims spring’s arrival. A song sparrow wearing camouflage.